Pine trees usually prefer sandy soil, so it is no wonder that so many species of pine tree are found in Florida. There are seven different pine species in the state: shortleaf pine, spruce pine, sand pine, slash pine, longleaf pine, loblolly pine and pond pine. Pines are classified as conifers because the trees have needles, instead of leaves, that are bound together in bunches and attached by scales to the branch. The number of needles in each bundle is an additional way to classify pine trees. The Australian pine, which is found in Florida, is not a member of the pine family, although the tree does resemble a pine. 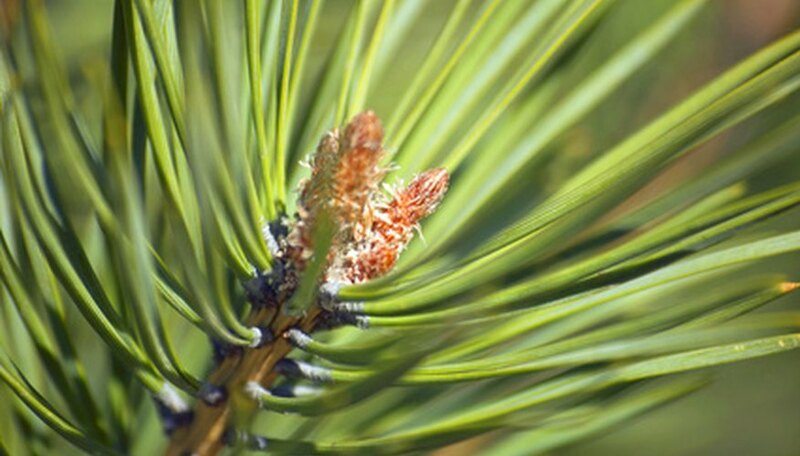 Two-needle pines have two needles per cluster and Florida pines with this characteristic include spruce pine and sand pine. The spruce pine, also called the cedar pine, is a member of the yellow pine family. The tree grows to a height between 80 and 90 feet. Its cone is oval and its bark is gray and grooved, according to The University of Florida. The tree can be found growing in the shade near water, either rivers or swamps. The sand pine, also called the scrub pine, can grow anywhere from 25 to 80 feet high. The cones are oval and its thick bark is either gray or reddish brown. The tree is found in sandy soil on hills or in wooded areas in higher elevations. Shortleaf pine and slash pine are two Florida pines whose needle count varies between two and three per bundle on the same tree. The shortleaf pine grows to a height of 98 feet and is a major lumber tree, according to “National Geographic Field Guide to the Trees of North America,” by Keith Rushforth and Charles Hollis. Its cone is oblong and its bark is scaly and covered with resin-filled pockets. The slash pine also grows to a height of 98 feet and is harvested for gum turpentine and rosins. Its cones feature thick, wood scales and its bark is furrowed and gray-brown in color. Three-needle pines have three needles per bundle. Florida pines with this characteristic include the loblollly pine, pond pine and longleaf pine. The loblolly pine, also called the bull pine or old-field pine, is one of the tallest eastern trees, growing to a height ranging from 80 to 100 feet tall with the tallest at 173 feet, according to the “National Wildlife Federation Field Guide to Trees of North America.” Its cones are oval and its medium brown bark is scaly. The tree's habitat not only includes swamps, but floodplains and sandy, upland forests. The height of a pond pine ranges from 40 to 80 feet. Many of its oval cones are fire cones, which are encased in a wax-like substance until the heat of a fire melts them. The bark is brown and scaly and its habitat includes swamps and wetlands along the coast. The longleaf pine, also called the Southern yellow pine, grows to heights from 60 to 100 feet. The cones are oval and its bark is medium brown and scaly, peeling off to reveal a lighter red-brown bark underneath. The longleaf has a wide habitat range, preferring the sandy, dry soil of the Atlantic and Gulf coastal plains.